Uh-Oh, Benji is in BIG Trouble! I need a vacation and I need it NOW! Today, Benji peed on my very expensive, very hard-to-clean massage chair and it breaks my heart to see him do that! Contrary to what some might perceive, taking care of three very active and fluffy cats is no simple feat. Besides worrying about their health, food and overall well-being, there is also the matter of making sure they don't pee anywhere their heart desire, which was what Benji did today! So now he's locked up inside the kitty condo as punishment! Chubbs, being the big brother will always keep Benji company when the latter is punished. See the picture? I'm sorry Master, let me out! Do you see why I am in dire need of a holiday now? A short simple one will do for me; I ain't fussy! I just need to get away from my home and my kids and enjoy a little RnR time to myself so I can rejuvenate and come home fresh and ready to fend for my kids again. I guess it's time for me to shop for Cheap Holidays online and I'm starting with ULookUBook. This site offers thousands of cheap holidays, discount hotels and last minute flights to bargain holiday destinations worldwide. I love that the choices are plenty and the prices reasonable. If you're fickle like me, worry not for this site also provides great travel guides with detailed tourist information on the most popular holiday countries and resorts to help you narrow down your holiday choice. Truly, it's a great site to visit for those of you in need of a short or a long break! So a mini holiday is exactly what I need right now; a wonderful pick-me-up vacation to refresh my weary soul so I'd come home to my fluffy kitties all smiley once more. Meanwhile, Benji is still in big trouble for messing up my massage chair and inside the kitty condo he shall remain! Master is mad with Benji today, naughty boy! Aggie always pee on my welcome mat GP.. so whenever they come to the human room.. all the welcome mats gets hidden..
oh why oh why must they like to pee suka hati kan? Now all the kitties are in the human room.. until NurKasih ends.. lol!! uh oh, somebody is in trouble!! Angers la me LJ! Benji still locked up, GRRRRRRRR! I dah lama gila tak watch NurKasih dearie….dah nak habis ke? Thanks for chopping meows, hugsy! Oh so glad to hear that Ane… this means I am practising well for when I do have real kids later he he! Oh no Lucas back to diapers, how old is he edi Ane? Still young right? LOL @ Benji wearing diapers hahhahahahahhaa, if got sure I buy for the fella! Hahahaah Benji in diapers! u mean they pee everywhere Mariuca? give toilet training a try! Don have la diapers hahahha but so cute if Benji wears diapers, like real baby cat then, meow! 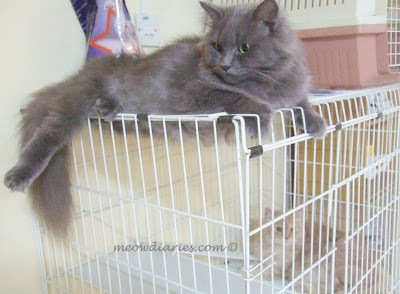 Now Benji merajuk inside the kitty condo don wan to face me, lol! yes so cute lah if Benji wears diapers!!! LOL merajuk some more!! what? you want to throw the massage chair.. eh tak leh clean ke? i think got a few more episode kot.. but finishing already lah.. Seriously the fella merajuk, quiet only inside there, back facing us hahahhaa well that’s what u get for peeing on mah chair!!!! First time ke? is he healthy.. or is he trying to tell you something? Tu la, I takleh follow… so nemind la… he he… wat u watching tonight? u cannot clean it kah?? replies.. then i check.. got so many.. had to reply at the the site pulak..
U ticked the notifikasi edi dearie? Test away! Dah makan ke tu? LOL Mon oso confused to see LJ testing her heart out here, meow! wah if leather.. must be expensive to replace the seat cover kan? ok dah no need to test edi..
baru sudah makan.. goreng ayam jer.. alamak i pulak dah sniffling ni..
hahahah... test test no more! Going out for dinner shortly dearie, rest la no need to do graphics tonight! Ok edi right with commenting here LJ? No need to test edi! yeap.. ok ok ok edi.. lol! Baru je keluar kitty condo ni LJ! Me still angry with him but B let him out! For dat, no wet food tonight! Don post while Im out LJ hahahha, wan to chop! ok.. see you later GP! Oh Benji ... not good!! I’m baaaaaack LJ, u can post away LOL! Tu la sure jangkit punya kan? Poor LJ, makan Panadol cepat! Oh no…. me on posting frenzy, how to chop if eyes closing edi? Wakey wakey! oh yeke? posting frenzy2? alamak.. ok ok.. will put stick on mah eyes..
looks like junior there is going to be grounded for some time... but lucky the chair is leather right? Least it is easy to clean. Using leather cleaner should do the trick no? hahhahaha LJ u wanna put stick on yr eyes?! yeah Mon.. so they will stay open..lol!! LJ, u no longer drinking coffee right? huh? eh drink.. am still drinking coffee? why lah? Some more B went out of his way to buy wet food for Benji tonight ish ish!! Favourite B dis benji! Monica! I just chopped 1 PB at RM, go check! LJ no longer drinking coffee? why oh why? sleepy but sleepy coz not feeling well... am i making sense? lol! so did Benji get his wet food? still drinking lah Mon.. lol!! i was trying to cut down but kenot lah.. lol! i just checked Mariuca still 0 ..
Hahahahha so funny la u Monica…. I said meow meow to greet you, u tot got chop is it? Aiyo sorry to confuse you me LOL now hhahahaha! hahahah i think u need to get some rest LJ coz it doesnt make sense LOL!! Yeah! And then B marah Phoebe cause Phoebe was chasing the boys and causing chaos hahahah cian Pheebs kena marah hahaha! hahhahaha... i think so too. lol!! hahahha.. wah dapat juga dia wet food eh? lol.. kalah B lah .. lol..
still Uh-Oh, Benji is in BIG Trouble! hahahahahahahh!!! not yet.. still awake ni.. sat lagi kot.. i want to chop!! LOL @ terkam Aggie!! Yeah sometimes hafta scold them when they get too rough kan, hehe so cute! I'm oso not sure what im doing online now LOL!! ohhh u're trying to cut down! :-D hehe not easy right! Hahahhaha I ter-LOL la when I saw ur comment cause I pictured u cutely asking me “wat meow2” sure confused dat time ROTFLMAO! hahahaha Mon..same same lah we all..lol..
acutally I'm arranging my image gallery.. come see..
Mariuca, u said the one Tekkaus is using can reply by email? how?? ROTFLMAO! confused to da max! hahahahahhhh!!! wahhh u ve image gallery? kaming!! Hahaha u online but still not dropping Mon hahah! LOL @ Aggie crying away hahahha macam kartun la! I cant cut down on coffee!!!! yelah.. she so chubby.. cute gils lari from Awan!! Hahahha I oso didn realize it came out as a meow2 chop cause usually will buzz2 u at TUO hahahhahaha! yelah.. i just did only.. lol!! I cant swallow Horlicks lah.. too lemak! hahahah i terus go to MD when i see meow2 LOL!!!!!!!!! LOL I like to see Benji run, mcm doggie…woof woof! Oh no it’s about time for supper Mon! I’m having pemes amos cookies now…with coffee! Tu la, sorry to confuse u Mon, hahahhaha didn’t mean to trick u like those hidden ec widgets LOL! So normally, when my brother comes to visit me I will ask him to buy "Stop" a kind of srpay where you spray on the same spot where they pee, they wont pee there again! I think there is a better brand, perhaps you should shop around at the vet or any pet shop to check. I think you ought to toilet train them if you have the time, it takes some times to do so but you will be happy and thanks yourself later when they know how to use toilet. I have so many Meows, if I have 3 like yous, I will definitely try to train them. Those Mat Salleh proved toilet trained to be workable. Mana tau, who knows one day all your Meows akan pandai pakai toilet. Hehehehe... good for you kan. Tak payah lagi empty all the litters, dah lah tu tak payah worry lagi mereka pee kat Massage Chair or their favourite spots, I think Benji tu nak book the Massage Chair for himself so that Meows lain tak boleh duduk situ, sebab tu lah dia buat his trademark tau, memang kuching macham tu, bila dia tak mau Meow-meow lain ambil alih tempatnya dia akan spay his pee, meaning his territory! I'm having same problem with BlueBerry and sometimes I dont even know who is the other cuprit(s) when I grounded BlueBerry in the toilet with his warm container, no condo. At my living at night there are 7 cats, the rest 9 of my cats including the rescued from Terengganu in the Shelter behind my kitchen, can see them through my kitchen windows and 3 male cats in 2 cages plus 4 kittens in another cage, all a special place in the shelter. Penat tau, the day when those people take some of these rescued cats and after the balance sent to SPCA, then only I will be left with my 17 cats, perhaps in KL to continue giving away some to good homes, then only I will be living my life to the fullest as a normal human being. I am trying to do this to have back my life and I think I need it badly. You poor thing... sending you my hugzzzz then to cool you down. aha.. i like that condo kitty..
Ehhh kondo kitty tuu mahal kan? nampak ajer besi tapi kalau beli atau tempah memang mahal tuuu..
tempat bawak boleh tarik kan? I still have that kondo kitty. yeah mini vakasi mini terapi diperlukan..
i like muka chubbs. memang nampak macam pengawal peribadi macam tu. hohoho. oh chubbs ni macam arwah Mufasa.. also good boy lah he... miss him so much..
his cemetery and Anja's dah tumbuh bunga dah..
Ohhh how nostalgic that sounds, dah tumbuh bunga, cian dia orang kan? Hugs!!! buat apa tu?? hehhhe.. sedih gitu...miss them!!! takper takper..depa dah happy dah.. yihaa.. happy happy balik ok!